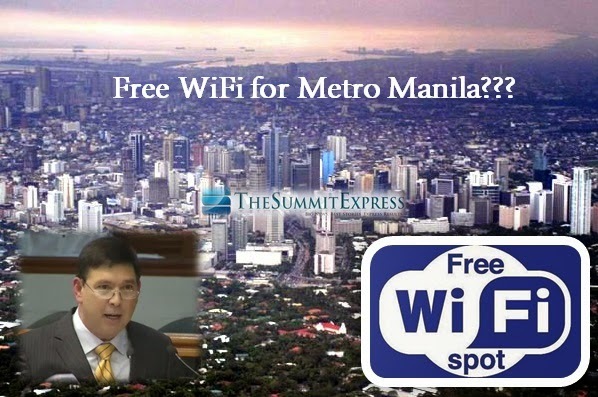 Manila, Philippines - We have heard of a new bill recently proposed by Senate Pro Tempore Ralph Recto, the controversial Senate Bill 2232 also known as 'Free Metro Manila WiFi Act of 2014' that requires the government to provision free public internet using WiFi in Metro Manila. A lot of reactions and comments are exclaimed as to this move and majority of which are pleased that finally the government is directing its attention in developing the country’s internet infrastructure. It is triggered by the result of a survey concluding the Philippines to have the slowest internet speed among other South East Asian countries. But the question now is this: Is the proposal feasible and sustainable enough to be approved as a bill? 1. Senate Bill 2232 or the proposed "Free Metro Manila Wi-Fi Act of 2014" states that the government shall provide public buildings, parks and national roads in the metropolis with broadband hotspots that will offer a stable internet connection to encourage discourse and trade in internet-related goods, services and content. 2. Senate Bill 2232 states that areas that will be provided with broadband hotspots include national and local government offices, public hospitals and health centers, public schools including state colleges and universities, public parks, the Ninoy Aquino International Airport (NAIA), public libraries, tollways and expressways, Epifanio delos Santos Avenue (EDSA) and other national roads, public transport terminals, the Port of Manila and railway stations, including those of MRT and LRT. Under the bill, these public spaces shall be ensured a range of broadband hotspots within a period of two years. 3. Internet connection to any of the broadband hotspots in the designated public spaces shall not be restricted with passwords. No fees should be collected from users. 4. The amount needed for the immediate implementation of proposed law will be obtained from the available funds of the National Telecommunication Commission (NTC) or the overall savings under the current national budget or General Appropriations Act. Indeed, we need free internet in airports, offices for business transactions and public schools and libraries for research and as an aid for better education. But, who in the right mind will do discourse and trades of internet-related goods, services and content in public places like parks, train stations and roads? Only BIG businessmen and women can do that who can’t get away from their dealings even for a minute and needs to closed transactions even inside their car. I can’t quite connect on how this means meet its ends. Unless the bill stated that it will help ease boredom while waiting for your turn on the ticket booth in train stations or till traffic in EDSA lightens up, that would make sense. And how will the government provide stable internet connection using Wi-Fi on public roads, tollways and expressways when users are inside vehicles and are constantly moving? (Except when you’re in EDSA) Wi-Fi is not designed as a mobile device. It’s a fixed wireless technology. I hope Senator Recto made some research first before drafting the bill. Let us assume that apart from the airports, offices and public schools and libraries, everyone needs an internet connection to settle their business dealings on parks and while on the road. And this is made easier thanks to the FREE WiFi internet. But is it secured enough to make business transactions? I mean everyone has access on the network. I’m not stupid enough to broadcast my credit card information in an unsecured connection. I’d rather pay Php2000 a month and avail a secure connection from private sectors than to have other people have access on my credit card account. The bill proposed to use NTCs funds for the project to be realized. So the government has available funds and the budget is not a concern. Although Senator Recto and his team have no concrete plan yet on how this bill will be implemented, we can assume two possibilities. First, is to tap any of the country’s Internet Service Providers (ISP) like PLDT, SMART, SUN, and GLOBE and lease their service that is cheaper since the government will just be paying a fixed monthly rate. But on the ISP’s point of view, this move will lower down their income. Why would they support a project that will kill their business? This leads to the second possibility of our government building its own internet infrastructure. How much money is needed to implement? I made my own computation using the following considerations. Let’s do EDSA as an example. For us to be able to establish a stable network, as standard, we need to deploy 24 access points per sq. km. One access point costs to $500. EDSA’s length is 23.8 km. Now, multiplying everything, in order to provide coverage in EDSA alone, will amount to Php13M. This estimated cost only includes the access points to be deployed. Transmission facilities, packet core network equipment, routers, the monthly recurring costs like maintenance and electricity are not yet included. Imagine how much the total cost will be. And another scary thing about this bill is its potential as a source of corruption. Remember the NBN-ZTE deal controversy? The deal that proposed to build a government-managed National Broadband Network (NBN) for the Philippines and the presentation of its construction to the Chinese firm ZTE. It can happen again through this bill. This is even worse if the bill will be approved since the allotment of the budget is backed up by regulations. But then, let’s be positive. Let us say that the Philippine government has changed. Can NTC be able to meet the target budget for this project? First and foremost, what is the source of NTC’s funds? NTC gets their funds from payments of licenses to operate of telecommunications and broadcasting companies. But this project will kill these companies’ business. It might even create an unbalance on the economy. I might be exaggerating but note; these companies are the highest taxpayers of the country. I’m not an economist, but I hope readers get my point. I understand where Senator Recto is coming from on providing free internet services to our under-served and low-income Filipinos, but will it kill them if they don’t have an internet connection? Why just find another way on how to help them afford internet services. I think that is far more feasible and sustainable. I’m just saying. ABOUT THE AUTHOR: Article written by NG. A techie 20-something engineer with broad knowledge about telecommunications and an active netizen.